How eye-tracking technology and computer simulations are working together to help out-of-home advertisers understand their place in the world. By Posterscope’s David Gordon and JCDecaux’s Chris Felton. The challenge for out-of-home (OOH) media research has long been to replicate what the consumer sees. The random unpredictability of the real world is inherently hard to imitate, and makes the task of analysing consumer engagement with the outdoor ads within it incredibly complex. Historically, research to capture where people look and for how long has concentrated on low-tech lab methods involving showing people photographs of street scenes and using eye-tracking headsets to monitor visibility. Not only do these techniques lack the lifelike authenticity of walking on a real street or driving an actual car, but, as we all become more advertising savvy, recruiting a sample without any bias towards the task adds its own unique challenge to gathering reliable results. In addition, with the advent of digital OOH, advertising itself has also changed, increasingly involving more moving images and digital ad extensions. Capturing the effect of a digital screen when it is seen at head height is as difficult as asking people to look at these moving images on a flat screen – neither accurately reflects real life. It became apparent that these lab research methods were no longer the solution for this digital environment. We needed a new idea. Posterscope and JCDecaux’s goal was to create a high-tech OOH environment that would build a unique picture of consumer behaviour, through a more accurate representation of reality. We wanted to create a new technique that would help brands understand engagement with creative OOH ad executions, and enable us to create a metric for statistical modelling. After talking to various research companies, we crossed paths with Second Life. It was here that the concept of creating a virtual world was conceived and the idea for VirtuoCity was born. VirtuoCity was a product of our desire to achieve an advanced understanding of the interaction of specific elements of OOH in creating engagement in real life. 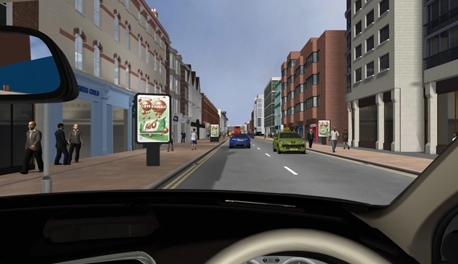 A sophisticated driving simulation, based on as life-like an experience as possible, VirtuoCity places respondents behind the wheel of a car in a virtual world as they drive through the suburbs and into a town centre (see main picture). VirtuoCity is able to take advantage of the dramatic evolution of eye-tracking technology, which has eradicated the need for kit, goggles or headsets. Sophisticated cameras are now built into screens allowing us to measure respondents’ eye movements in response to the computer-generated OOH posters in a non-invasive way, which allows the ‘drivers’ to fully concentrate on driving. At the end of their journeys, participants are asked to recall any advertising they remember seeing. They are prompted with a list of eight brands – five are actual campaigns and three are dummies. We’ve found this to be an effective measure, as dummies barely get any mentions, which demonstrates that people genuinely do recall what they have seen even when focused on the task of driving. The research captures eye fixations and dwell time from different drive scenarios where formats change in size, combination and show different frequencies of creative. VirtuoCity has provided us with a powerful tool that, alongside Route, which launched in February, gives the outdoor industry unprecedented access to insight into understanding the audience to OOH advertising. Route, the latest incarnation of POSTAR, has been an enormous leap forward for the outdoor industry. The mix of environments and formats make it different from anything that has gone before, and the investment in GPS meters for the travel survey results in it being one of the most significant pieces of media research ever undertaken. Route allows us to plan out-of-home advertising in a completely different way. For the first time, individual frame data is available, 360,000 panels – building on the 120,000 panels offered by POSTAR before it. This allows media planners the opportunity to choose any combination and analyse the potential impact of their selection. Route also represents a huge shift in approach, putting the audience at its heart for the first time. And, importantly for brands, it offers the ability to evaluate what can be delivered across OOH environments and formats, as advertisers increasingly demand greater accountability across all aspects of their campaigns. VirtuoCity offers unparallelled additional insight into how consumers interact with outdoor ads, creating an engagement index for statistical modelling that compliments Route’s industry currency. Ultimately, it helps us to help advertisers create effective OOH campaigns, and gives us a better understanding of the benefit of, for example, what effective frequency in out-of-home is. The combination of Route and research technology such as VirtuoCity is delivering incredibly powerful audience insight that is revolutionising the way we plan OOH and redefining the way we can now define campaigns in the outdoor space. Together they are ushering in an exciting new era of OOH effectiveness with the potential to transform the OOH medium and the possibilities for brands.